Unai Emery admitted he wanted Arsenal fans at Sunday's north London derby to match the support Tottenham received in their win over Chelsea last week. 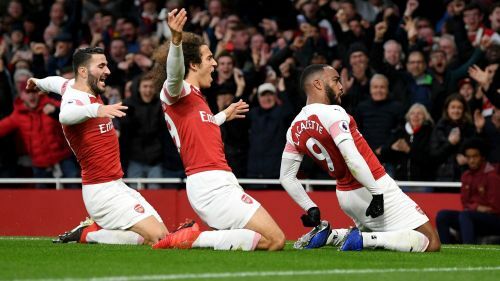 The Gunners powered past their fierce rivals at Emirates Stadium to claim a thrilling 4-2 victory thanks to second-half goals in the space of three minutes from Alexandre Lacazette and Lucas Torreira. Spurs had overturned Pierre-Emerick Aubameyang's opener through Eric Dier and Harry Kane, but the Gabon striker scored his 10th Premier League goal of the season to make it 2-2 before the late double. Arsenal fans created a boisterous atmosphere and stayed behind after the final whistle to celebrate with several of the players, who remained out on the pitch to thank their supporters. And Emery says he hoped to see such a strong connection after watching the Spurs faithful cheer their side to an impressive 3-1 win over Chelsea at Wembley. "They pushed a lot for us," he told Sky Sports. "In a difficult moment in the first half, we kept calm. "We spoke in the dressing room and we were having good minutes in the game. [We said] The result is not good, but we can continue in our work and our planning for the game. The supporters are going to push us. "We were watching Tottenham play at home against Chelsea, they won, with a big, big performance with their supporters. We were speaking about that." Emery suggested it was not his finest victory since taking over at the club, insisting the result – which lifts them up to fourth in the table, ahead of Spurs on goal difference – only became important because they won at Bournemouth last time out in the league. "Last week, it was the same. We needed to win first in Bournemouth because, with three points, we can play against Tottenham here with the possibility of overtaking them in the table. If you don't win last week, this possibility you've lost," he said. "Every match is an important three points. For supporters, it's a special match, and for us because we want to give them this special match. I think every player gave this. But now, I'm thinking [about] Wednesday and Manchester [United]." Lacazette and Aaron Ramsey helped swing the match in Arsenal's favour as half-time substitutes, and Emery explained why he felt they could be crucial in helping his side overturn a deficit at the break. "In this moment, we needed something different on the pitch. Above all, two situations for me were the reason to do that: one is Aaron, who knows this derby; and second is the possibility with Laca to find, when we can have chances, his capacity is very big, and he showed us that," the former Paris Saint-Germain boss said.